The concept of time travel has been studied by great minds in physics, including Einstein and Tesla, but no one knows for sure that it is possible. Yet stories of a few unexplained events have occurred over the years that suggest people have either purposefully, or unintentionally slipped through time warps. In June, 1950, New York police were perplexed when they allegedly investigated the death of Rudolph Fentz. Fentz was killed when hit by a car in Times Square. He was wearing clothes that would have been fashionable about a century earlier. In his pocket, Fentz was carrying about $70, a letter postmarked 1876, some very old business cards, a bill for the care of a horse and the washing of a carriage, and a copper token for a beer at a tavern that no longer existed. Research revealed that a man named Rudolph Fentz, 29, disappeared in New York City without a trace in 1876. His disappearance was never solved. It appeared that Fentz was suddenly propelled from the streets of New York in 1876 to 1950. That he was struck by a moving vehicle and killed suggested that he was used to slow-moving horses and carriages and stepped out on the street without thinking that he was going to be in any great danger. The accident also suggests that Fentz either did not realize he had been propelled through time into the future, or that he was dazed and confused by what had happened to him. The question of course is how this happened to him. A great story if it had really happened. The Rudolf Fentz story was found to have been copied from a short work of fiction by Jack Finney that first appeared in a popular sci-fi magazine in the 1950's. During the reopening of the South Fork Bridge at Gold Bridge, Canada in 1941 a photographer captured a crowd of people gathered to observe the event. That photo has gained Internet interest because it appears to show a young man in the midst of the crowd dressed in modern clothes. He is wearing smart sun glasses, a logo printed T-shirt and seems to be holding a portable camera. He just does not seem to belong in that crowd. Some have suggested that the man was "photo-shopped" into the picture. Either that or he was a time traveler who happened to get his picture taken during his brief visit. Others suggest that the clothes, the sunglasses and even the hair style that marked this guy as a possible time traveler were possible at the time the picture was snapped. To date we have not found proof that the picture was altered, or that it was a hoax. It has made the rounds of the Internet and remains somewhat of a mystery to this day. ​Then there is the case of Hakan Nordkvist of Sweden who claimed that on August 30, 2006, he crawled under his kitchen sink to fix a leak in the plumbing. When he stuck his head under the sink he found himself looking into a tunnel. Seeing a light at the far end of the tunnel Nordkvist said he decided to crawl through and see what was at the other end. When he reached the other end Nordkvist said he found himself in the year 2042. And there he met himself, at age 72. The two men looked alike and both had tattoos that were identical. 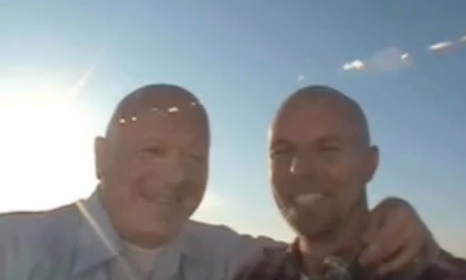 Nordkvist said he had a cell phone with a camera in his pocket so he snapped a picture of himself standing next to himself to prove his story. He later crawled back through the tunnel and returned home in 2012 just in time for supper, he quipped. Was it a true story or did Nordkvist make it all up? His story sounds strangely like a "near-death" experience which was either dreamed or made up. But how do we explain the picture of the old and younger Hakan Nordkvists standing arm in arm? Only he knows. Then there was the story of Andrew Carlssin, the man who claimed to have traveled from the year 2256 and made a fortune on stock market trading based on his knowledge from the future. After allegedly investing an initial $800 and earning over $350 million, he was arrested and jailed by authorities in New York in 2003 on charges of insider trading. But then Carlssin posted bail and mysteriously disappeared. Carlssin's defense was that he was a time traveler and just used knowledge of the future to capitalize on his investments. What authorities could not explain was how the man turned an investment of just $800 into a portfolio valued at over $350 million in just two weeks. Or so the story said. They could not prove the charge of insider trading, however. And Carlssin was never tracked down after his strange disappearance. This is because he did not exist. New York police said they have no record of ever arresting and charging a man by that name for insider trading on Wall Street. It appears to be a very clever piece of fiction that went viral on the World Wide Web. Time travel may be possible. Yet if it would ever be possible at some future time, we would think that such events as described in the stories above might be happening. Worse there is the possibility that a time traveler might someday go into the past and change something, thus altering the present. Would we be aware of such an event if it happened? It would certainly have a dramatic effect on us if we suddenly disappeared because our parents never met . . . or worse . . . one of them was accidentally killed. How do we know that the world isn't suffering from the tinkering of time travelers from the future even today? Might that not explain some of the insanity that appears to be going on around us?